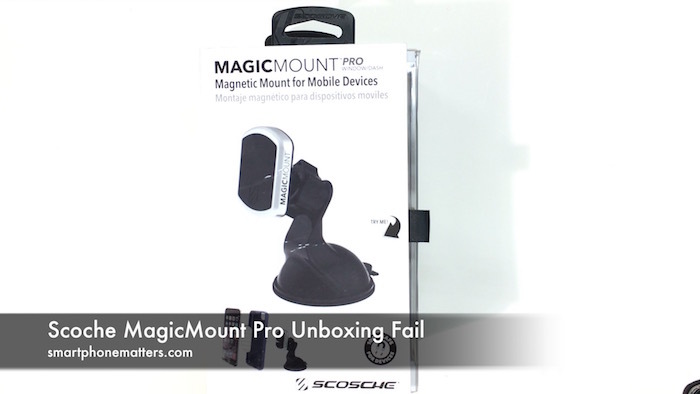 Today I wanted to tell you about my unboxing fail with the Scoche MagicMount Pro. You use the MagicMount Pro to attach your smartphone to the dashboard of your car. My wife and I both bought new cars in the last year and want to be able to mount our iPhones to the dashboard. I bought two different mounts to unbox, setup, and try out. The first was the Pearl Auto Phone Mount and the second was the MagicMount Pro. I ordered this mount from Amazon in February and it had been sitting on my desk in the box from Amazon. I finally decided to make the unboxing video so I took it out of the package, put it on the desk and turned on the camera. Little did I realize I was in for a surprise. I bought the MagicMount Pro on amazon.com, it was sold by a third party seller and fulfilled by Amazon. I paid $49.99 for this MagicMount Pro and a Rose Gold Trim and Plate Replacement Kit. My wife has a Rose Gold iPhone SE in a clear case. Since the magnetic plate installs behind the case I figured I’d get a rose gold plate so it would match the back of the phone. The kit also included a rose gold trim piece for the MagicMount Pro. Before getting the mount out of the box I noticed that the box was beat up. It’s hard to notice in my video as the lights are really bright but this looked like the type of box you see in the returned or clearance item section of a store. I paid a lot of money for a new product so I was a little annoyed. Once I started the unboxing, I found out the magnetic plates where missing from the package. They should have been in the flip out cover under some plastic tabs but they were not. I don’t know if the seller decided to remove them as they considered the plates in the bundled kit as replacements or some previous buyer removed them but they were no where to be found. It gets worse, because after I took the MagicMount out of the box, I found out the the magnets that are supposed to be in the MagicMount itself were missing. The rubber cover on the MagicMount itself was half pried off and there were no magnets inside so this product was completely useless. Once I realized this, I stopped my unboxing video and contacted Amazon support. The agreed I could return it and even comped me two day free shipping on ordering a replacement item. I decided to order a second Pearl Phone Mount instead. This worked out really well because the package had been sitting so long on my desk the item was outside of the return window. Thanks to Amazon support for making it right. Now, I want to say this wasn’t Scoche’s fault. I ordered from a third party seller on Amazon. I didn’t really think about it much at the time. I doubt they are authorized to resell Scoche products. I spent about 15 minutes trying to figure out how to contact the seller. When you go to leave a one start review Amazon prompted me to talk to customer service first. In the end I decided I’d order another Pearl Mount. I was impressed with the quality so I went that route instead.